Card payments transaction fees, predominantly governed by Visa and Mastercard, are about to undergo significant change in the structure of how fees are charged, and this will affect all merchants currently accepting debit cards for their goods and services. Merchants have been charged a flat rate fee for debit card processing (e.g €0.40 per transaction, regardless the value of the transaction.) In comparison, credit cards have been charged at a (pro rata) percentage of the card transactions (e.g. 1.95% of the value of the transaction.) From January 1st 2016, Visa and Mastercard will change from charging a flat rate for debit cards and implement a percentage fee for debit card transactions. ‘Interchange’ fee is a term used in the payment card industry to describe a fee paid between banks (the merchant bank to the cardholder’s bank) for the acceptance of card based transactions. Didn’t TD Michael Noonan say it would be cheaper? In March 2015, the European Parliament voted to cap interchange for debit card transactions at 0.2%. But the Irish government decided to lower it further and in the Budget 2016 the Irish Government set the interchange cap for debit cards at 0.1%. This will mean that Ireland’s debit card interchange rate will be the lowest in Europe. It seems debit cards are taking over and replacing cheques and even ATM's. As the card technologies improve shoppers are using credit or debit cards for purchasing goods and services more and more. If you take a look at the graph below, sourced from Banking & Payments Federation Ireland, you can see that debit card usage is rising. 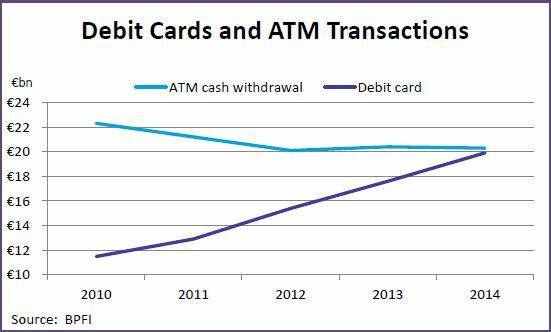 If you look at the graph below you can see that debit card payments are outstripping cash payments and we expect this trend to continue. All merchant service providers will be making contact with their customers within the next few months to advise them of their new debit card rates.